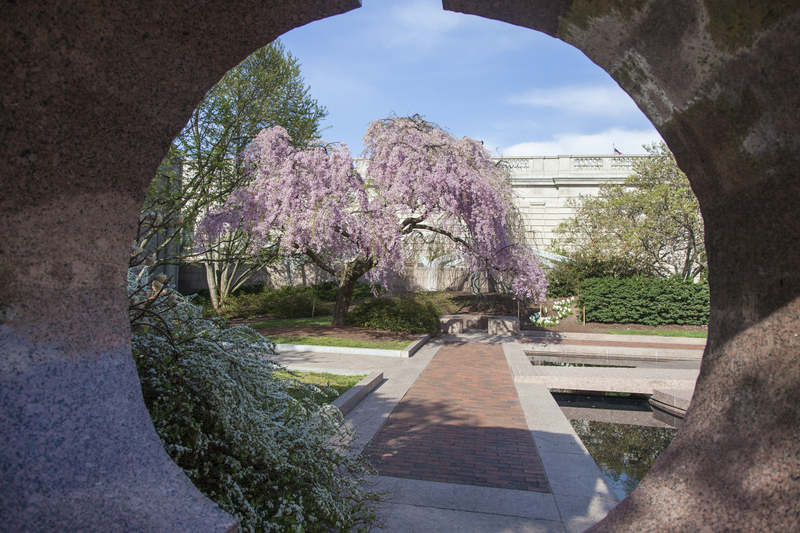 A weeping cherry tree in full bloom in the Sackler’s Moongate garden. Cory Grace is Digital Imaging & Asset Specialist at Freer|Sackler. The other morning, when on assignment in the Sackler pavilion, I caught a glimpse of a weeping cherry tree in the Moongate Garden in the camera’s viewfinder and knew I had to go outside and take a photograph. The cherry trees are in full bloom, and the city is full of visitors heading to the tidal basin for a look. But how many people know about this one? I grabbed the camera and went outside. A female mallard swam in the pool, and a couple of tourists meandered through the garden as I captured the most graceful and naturally beautiful tree in the city. Next Post Next Post: Hiaaaaa! Drumroll, Please!